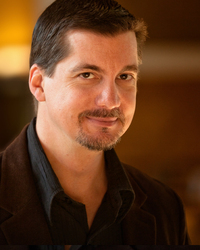 D.C. Douglas will forever be known as the sinister voice of Albert Wesker ("Resident Evil"), screaming "Chriiiisssss" as he melts in a lava lake, or as the soulful voice of Legion in the "Mass Effect" series, pulling on the heartstrings of fans around the world. This is a far cry from his other roles, such as the persnickety alien Zepht in "Star Trek: Enterprise" or the logical Legion in the "Mass Effect" videogame series. He's been in all sorts of video games, as The Master in "Buffy," "The Vampire Slayer," AWACS in "Ace Combat 6," Archangel Michael in "Might & Magic Heroes VI," Raven in "Tekken 6? and "Street Fighter X Tekken," and Albert Wesker in "Resident Evil: Umbrella," & "Darkside Chronicles," "Mercenaries," "Capcom Versus Marvel 3" and "Resident Evil 5." Douglas' anime credits include President Paradine in "Tales of Graces f." Alexei Dinoia in "Tales of Vesperia." Kelvin Garr in "Tales of the World," Grimoire Noir in "Nier Replicant," Gabi & Taihaku in ".hack Vol1 & 2," Genji Kamogawa in "Hajime no ippo," and Shori Shibuya in "God, Save Our King!" Recent television appearances include "Castle," "Workaholics," "Criminal Minds," "NCIS," and "2 Broke Girls." Highlight credits for fans of sci-fi, horror and fantasy include "Star Trek: Enterprise," "Charmed," "Passions," "Titanic II," and "666: The Child." Douglas can be seen in the upcoming sci-fi thriller, "Apocalypse Kiss" as the serial killer Adrian (an homage to Albert Wesker) starring alongside Troma Pictures legend, Lloyd Kaufman. Other cartoon/anime/game highlights include: One Piece as X Drake, Regular Show as (TBA recurring in season 8), Final Fantasy XV as Weskham Armaugh, Trails of Cold Steel as Rufus Albarea, Fire Emblem: Fates as foxy grandpa Gunter, Transformers: Rescue Bots as Chase, Family Guy as Superman, etc. DC is also a very memorable convention guest, as his panels can take certain creative twists on the characters he has played, and he also regularly participates in other convention events.